Verizon is currently the world's only commercial 5G operator. 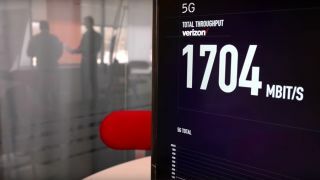 Verizon has completed the world’s first data transmission to a smartphone on a commercial, standards-based 5G network. The US operator launched the world’s first 5G network last month, offering Fixed Wireless Access (FWA) broadband services in several US cites. However mobile broadband services are expected to arrive alongside the first compatible handsets in 2019. The company says this latest trial is a significant milestone on that journey as it was able to conduct web browsing and make a video call using Motorola moto Ze devices paired with a 5G moto mod – a 5G upgradable smartphone. The device used Verizon’s 28GHz mmWave spectrum and was powered by Qualcomm’s Snapdragon X50 5G modem and QTM052 mmWave antenna modules. Samsung’s 5G New Radio (5GNR) equipment was also used in the trial. “Samsung’s early and extensive innovation in 5G is helping to lay the foundation for the next-generation of wireless communications,” added Magnus Ojert, head of Samsung America’s Networks Division. EE plans to launch 5G in 16 UK cities in 2019, while Vodafone, O2 and Three also have plans in the works. Juniper Research anticipates that global operator 5G revenues will be around $984 million next year before increasing at an annual rate of 160 per cent to $300 billion figure six years later.